American DJ Light Bridge One stand is ideal for mobile discos and is strong, yet lightweight and portable. The system comprises of 2 x Winch stands, and the trussing is a 3 metre wide Triangle section which is used to span between the stands. The truss is supplied in 2 x Dura Truss 1.5m sections sections for easy portability. Considering purchasing the American DJ Light Bridge One? Have questions? Ask people who've recently bought one. Do you own the American DJ Light Bridge One? Why not write a review based on your experience with it. Bought this stand as needed an upgrade, this stand is amazing for the price truly unbeatable with build quality. The wind up stands are rather weighty but defiantly do the job! Had it a couple a months not one problem with it. and looks fantastic! Loads of my customers have complimented how good and professional my setup looks! After using a number of truss and mounts, this is incredibly strong. The stands are quite heavy but that's expected due to its strength. Literally 2 minutes to erect. Excellent quality bit of kit. Sturdy and solid and looks professional. Weighs a lot though!! You won't want to carry it up any stairs.! Prompt delivery from DJKit. Great Product, really the best lightbridge I've worked with. Excleent dispatch and service, Tks djkit job very well done! So much easier with this and get alot more height than old rig. Would recommend spending that little extra for this. Good product, rugged, fast and efficient service as always from the guys at DJKit. Great bit of kit but watch the cable pulley! Overall these are good solid stands, pretty easy to assemble and having the winch means it's much more fun setting up without needing to stand on a ladder! The only issue is that the groove on the cable pulley is quite shallow and second time I used the stands the cable jumped out when being wound up and jammed, so now as well as making sure to watch it carefully I'm also making sure to carry the tools to undo and fix it! Very Happy..... great build quality. 2nd time I've bought this, well worth getting! I bought one about 18 months ago and through the wear and tear associated with being a mobile DJ, I decided it was time to invest a new Light Bridge One. There have been some subtle updates - trussing seems better, more solid, and tripods have had a couple of things moved which are nice touches. If you do buy this, I recommend getting the Accu case to store and transport it in - it will save you time and project the Light Bridge One. Usual great service from DJKit too. 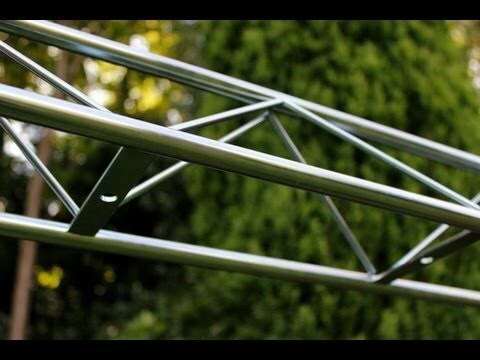 This is an awesome truss system. Great for mobile DJs with a large lighting rig and its super portable and lightweight compared to other solutions. 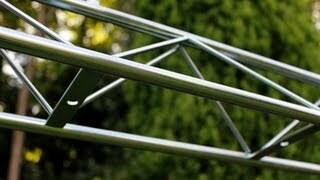 I would definitely recommend this truss system! Was very happy when my ADJ light bridge One arrived. This is a very sturdy/stable gantry indeed. This would not be knocked over very easily. I can now fix my lighting, wire everything and at a height that is convenient for me, before setting the height to which I'll get the best effect with the space available. As mentioned in other reviews, the stands are quite heavy but if you have a lot of expensive lights up on your gantry, then you can have peace of mind that they will be perfectly safe. Not the cheapest of rigs but you definitely get what you pay for. Solid construction. Very happy. Rated to cary a super heavy 100kg, this system is perfect for even the largest mobile gigs. The heavy duty wind up stands, are just that. Even with 10 fixtures loaded across the 3m truss, winding up the stands is effortless with their ratchet style wind ups and mechanical advantage built in. Talking of heavy duty again, this system (unlike many others) has no sag in the middle what so ever. Whats more, this system can be extended to a 3 or 4 sections system to span 4.5 or 6m respectively. - In all honesty, I have 6 sections of this and often use 4 or 5 without hesitation... Ensuring my load is spread evenly... or use 6sections (9m) with 3 or 4 stands supporting (an extra one in the middle) The construction of the truss is superb with very neat welds, however my favourite feature is the unscrew-able top pin, which means if you are going to be supporting the full 100km you can counter any potential sag you may incur (although I haven't yet) Build time...Literally about 2 minutes... Pop open both stands, clip together both sections of truss (takes about 30seconds) and pop the truss resting on the stands before pushing 2 pins through at each side to secure... It probably took me longer to write that than to do it... OK, basically I love it, as you've probably guessed... in 6years of using trussing, this is by far my favourite product yet... I've hung all this at once; 10 moving heads, 4 CO2 effect foggers, strobes and even sometimes my tops from their M10 rigging points... and I've even done pull-ups on the thing, its solid as a rock !!! Ideal if you are mobile and will be setting up on your own. With upgrading my lighting to 8 led pars and 2 moving heads and few others I needed a better stand so this was what I chose and it is fab, build quality is great, can be set up on your own and can use one 5ft truss piece or both to make 10ft also can be extended to 15ft if you buy another truss section. Recommend for mobile djs. A brilliant low cost alternative to some of the more professional options I looked at. Impressed by the quality of the gear and ease of set up. I bought the extension bridge and was really pleased that, with a whole load of lighting loaded up, it didn't sag at all. The stands were really well made and easy to operate single handed. The band have never looked so good. I'd recommend this rig to anyone who wants value for money and doesn't want to take up too much room in the van. A little heavier than I might have liked perhaps, but a solid piece of kit and a doddle to put up single-handed. I string my 2m light curtain between the stands, lodging its pole on the winch housings. Brilliant piece of kit! Very well made. The winch stands are smooth and easy to turn even with a full rig! Can't go wrong for the price! I ordered this product and the first one that came was rusty on the both of the metal trussing units, I rang djkit and they picked the rusty units up and delivered some brand new ones within 2 days! The unit looks amazing and is defiantly worth the price. The winch stands are quite heavy though, but at least this means they have been well built! This will make your mobile disco service look very professional. Seen a video for American DJ Light Bridge One online or have you own video? You will earn 538 loyalty points with this product worth £1.35, when logged in. Check out American DJ Light Bridge One on DJkit.com!